ESPE can help guide you through your career in paediatric endocrinology. Our mission is to advance excellence in paediatric endocrinology and diabetes by promoting research, education and medical practice to the benefit of child and adolescent health throughout the world. Membership offers an international forum for networking and collaborations with lead experts in the field. There are also a number of fantastic scientific and educational opportunities, including access to funding. 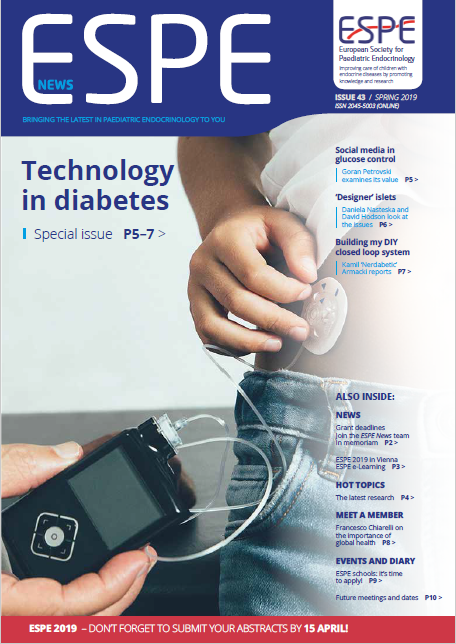 Technology in diabetes theme: Social media in glucose control | 'Designer' islets | Building a DIY closed loop system | Interview with Francesco Chiarelli | ESPE 2019 in Vienna | e-Learning update | Hot Topics | ESPE news and deadlines.